ArduiComm is a Windows program developed by 612 Photonics, LLC to provide a simple way to directly control your Arduino board through PC. The basic interface of this program is shown in figure 1. This program is designed for Arduino Nano board. It should work for UNO and many other boards as well if they have pinout similar to Nano. For Arduino Mega board, only part of the pins listed on the interface can be accessed. Use Arduino Nano board as an example, ArduiComm can directly configure each of the 11 digital pins D2~D13 (D0 and D1 are reserved for serial communication between Arduino and PC) as output pin or input pin. For an output pin, it can be set as “HI” or “LO”, providing logical high or low voltage level. For an input pin, it can read the external logical signal level and display “HI” or “LO” accordingly. ArduiComm can also directly configure each of the eight analog pins A0~A7 as analog input and read external signals ranging from 0V ~ 5V. The result will be displayed as a number between 0 ~ 1023 at the text field for each pin. If you need more digital I/O pins, six of the eight analog pins A0~A5 can be configured as digital pins and used as regular digital I/O pins similar to D2~D13. Also, for Arduino Nano board, six digital pins D3, D5, D6, D9, D10, D11 can be used to provide PWM (pulse width modulation) output. A light version of ArduiComm can be downloaded free of charge at the following link. 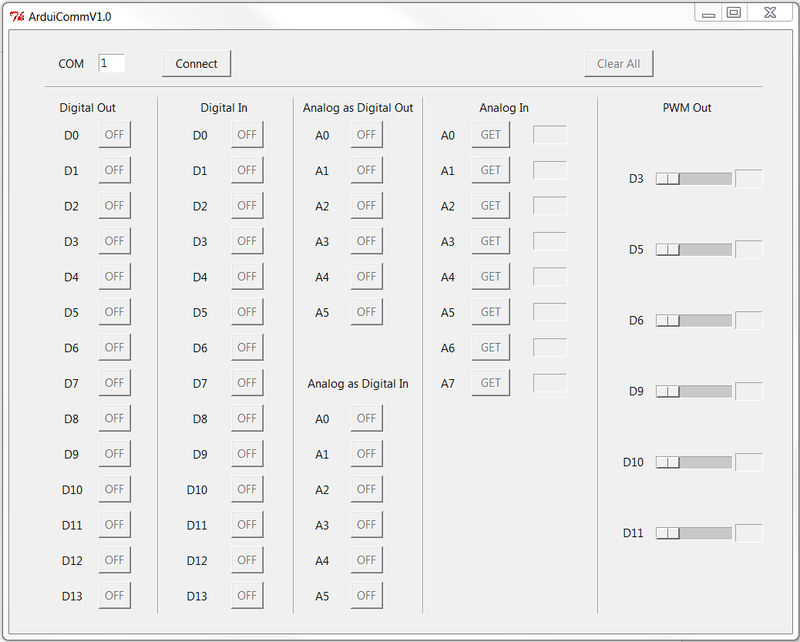 This version allows user to access five digital I/O pins D2, D3, D4, D5, D13, two analog pins A0, A1, and also D3 and D5 as PWM output. If you need to access more I/O pins of your Arduino board, you can purchase the full version of this program below. This version opens up all the rest pins to allow user to fully control the Arduino board. After you pay with PayPal, please click “Return to Merchant” or “Return to 612 Photonics LLC”, and you will be sent to the download page. Alternatively, you can send us an email (612photonics@gmail.com) to request the link to the download page. For a detailed description of how to use this program, please refer to our whitepaper ArduiComm. We encourage you to download and play with the free version of software before you buy the full version to make sure this software works on your system. Thanks for supporting our work by purchasing the software!